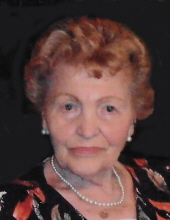 MARY MALEN age 93, passed away peacefully April 13, 2019. Beloved wife of John for over 67 years; loving mother of Irene Terry (David) and Raymond (Christine); cherished grandmother of Andrew Hren, Sonia Hren, Christoper Malen, Matthew Malen and Ashleigh Malen; great-grandmother of Marianna Hren and Andrew Hren. Special thanks to Dr. Peter Anders for his professional care and compassion. Friends may call at the KOLODIY-LAZUTA FUNERAL HOME, 5677 STATE RD., PARMA, TUESDAY 5-8 P.M. PARASTAS 6 P.M. Funeral Liturgy Wednesday, April 17 at St. Josaphat Ukrainian Catholic Cathedral at 10 a.m. (PLEASE MEET AT CATHEDRAL). Interment St. Andrew Cemetery. To send flowers or a remembrance gift to the family of Mary Malen, please visit our Tribute Store. "Email Address" would like to share the life celebration of Mary Malen. Click on the "link" to go to share a favorite memory or leave a condolence message for the family.